Wax Flowers are versatile flowers that are both green and filler that is used by many florists for creating today’s modern floral arrangements. They are crisp and vibrant with petals that resemble miniature daisy flowers when fully open. Use them to accent corsages, boutonnieres, unity candles, and many other creative arrangements. They are very bushy plants with thick foliage and many flowers growing on each branch. Every flower contains a cup-shaped center with 4 surrounding petals. This central cup is often brightly colored with red and green tones that contrast prominently with the surrounding petal colors, coming in shades of white, pink, dark pink, and other tones. They come in several tones to complement your floral arrangements. 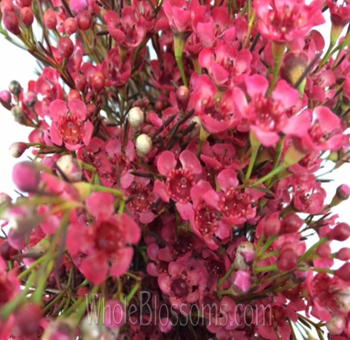 The botanical name for the commonly known wax flower is ‘hamelaucium.' It's a genus of shrubs that are originally found in Western Australia. They are sweet smelling and look similar to blooms of the tea treas. 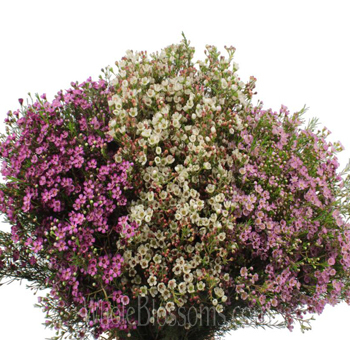 This makes them the perfect addition to entirely any garden, home décor or bouquets. 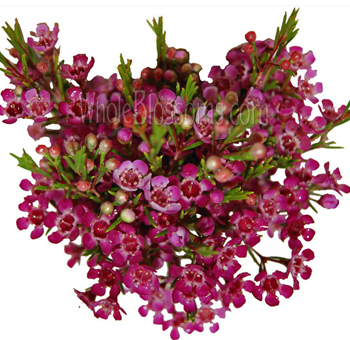 The most known and widespread species of wax flower would be the Geraldton wax flower which is cultivated mainly for its attractive blooms. The species of this flower grow as woody evergreen shrubs ranging in height from fifteen centimeters to large three meters. Their leaves contain oil glands and are small to medium sized. They have a beautiful scent when crushed. The delicate flowers have a total of five petals along with ten stamens, and a small hardened fruit. 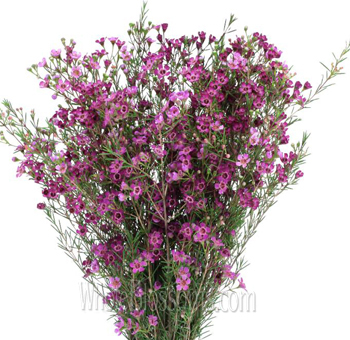 Wax flower are lovely little flowers that are extensively used in a lot of floral arrangements. But apart from that these flowers have plenty other uses. They are used in corsages. As cake decorations, tucked into napkins of guests at a reception or dinner party, small centerpieces, bouquets and as sprigs in dressing tables. These flowers have a really soft and cleansing smell that will surely uplift your mood and make you feel energetic. A French botanist first discovered a species of this plant, but the source of this is still unclear till date. They are called wax flowers because their petals feel slightly waxy. There are around fourteen other species in this genus. These flowers are limited to their native habitats in Western Australia, and these species are more commonly found in heathland communities. There they are able to grow well in the sand near the coast or inland areas. They prefer semi-arid regions and climates. They grow exceptionally well in dryer climates with good sun and drainage. They are this very hardy and able to come through droughts and frost. You'll find them growing in gardens all across southern Australia. Once introduced in the USA these flowers gained momentum and popularity here too. They have become a huge rage in the cut flower industry since they're also able to last up to three weeks. Wax flowers lovely small structures make them perfect for any floral arrangements. Especially when it comes to boutonnieres, these flowers are a wonder. They suffer very less pest or diseases and make for low maintenance but an eye-catching addition to bouquets and centerpieces. A white wax flower bouquet is a breathtakingly beautiful thing to see. 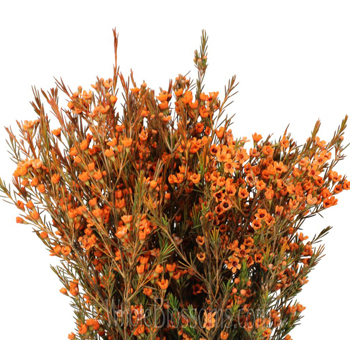 The wax flower comes in other colors too like pink, purple and orange. Their petals are lemony and fresh smelling symbolizing patience and long lasting love. These flowers are therefore a great choice for weddings or anniversary events. It can give a very boho chic look and is, in general, a very affordable choice for people on a budget. This great accent flower is also able to stand on its own so don't shy away from making a stunning centerpiece out of them.They are both flexible and durable. Also, they are very easy to work with and pair well with other companion flowers. These flowers create a very picturesque effect and can be a beautiful addition to the guest's tables. Combining them with other smaller blooms can create an effective centerpiece. For a more rustic look, many pair them with tulips. This too is a wonderful arrangement not only for a centerpiece but also for a bouquet. These small blooms also make really good boutonnieres. 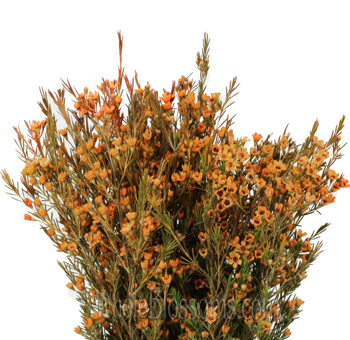 Orange wax flowers look absolutely amazing with grey tuxedos. 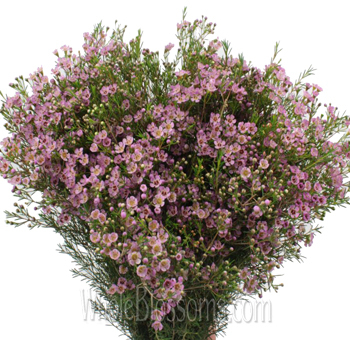 Pink and purple wax flowers colors can be added to the bridesmaid's bouquets for a fuller and voluminous effect. The best thing to do would be to buy wax flowers in bulk. They can be used in so many floral arrangements as long as you can get creative. They make perfect accents for wedding altars, the aisle, and even the brides crown. Honestly, these flowers are a game changer. But make sure that you purchase them from a trusted source. Buying them wholesale from online stores is a good idea. We recommend heading to Whole Blossoms a trusted cut flower wholesaler that can cater to all your flower needs. They have an easy to navigate website that has a range of flowers, greenery and filler flowers to choose from. These flowers are delivered fresh and right at your doorstep. They even have an amazing 24/7hour delivery system which is a blessing for event planners, floral designers and even do it yourself brides. 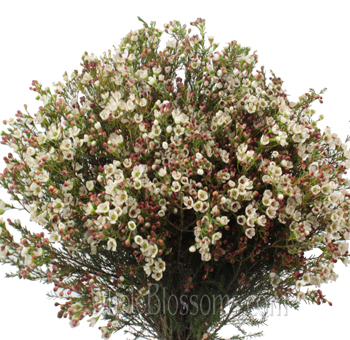 Whole Blossoms have wax flowers for sale, and they are available at a very affordable price. When you buy in bulk from such online wholesaler, you not only save money but also have tons of freedom to be creative and experiment with the flowers.